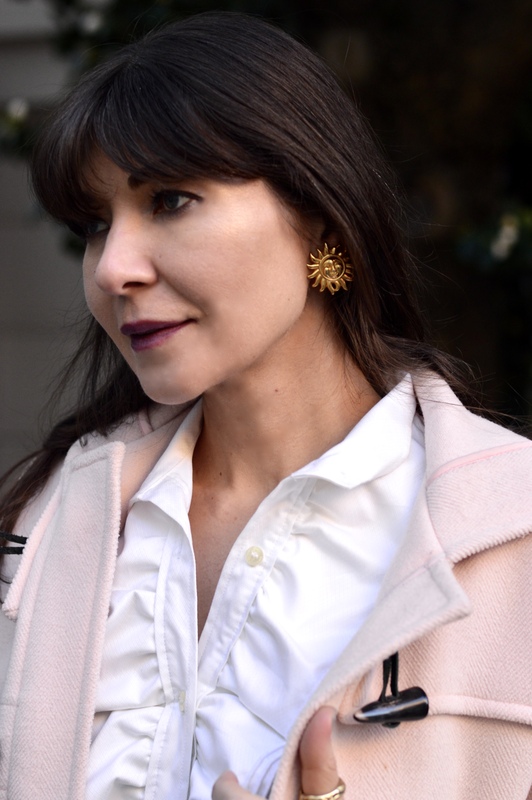 I pulled many of the pieces from my go-to, Closet 1951, (the jeans and the jewelry are mine), a treasure trove of designer consignment goodness, and by the way you can find a selection of my jewelry there, so next time you’re in Cow Hollow make sure to swing by! When I spotted the extra ruffled shirt, I knew I wanted to wear it with my treasured vintage Levi’s. They are faded just so and I love the contrast of the somewhat tongue-in-cheek exaggerated with hints of the 70s tux shirt from Dolce and Gabbana and the classic American denim. The pale pink duffle coat from heritage brand Burberry, begged me to wear it. I need more color in my winter wardrobe and I’ve always had a weakness for the distinct toggle button closure. 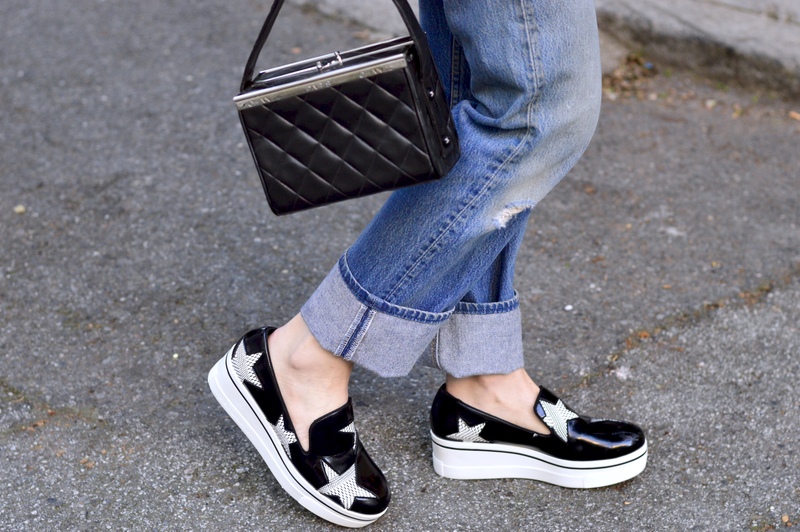 Now for the accessories–the box Chanel bag is so unique and special, it dates to the 80s and oozes personality, I needed shoes that matched its presence and I think the Binx star platform slip-ons by Stella McCartney are are style, quirkiness, and comfort rolled into one. For jewelry I wanted fun and distinct pieces. The Versace star earrings just make me smile, they are just the right size to be noticed, but not overwhelming. The zodiac charm bracelet by Kenneth Lane adds whimsy as only costume jewelry can. If you have always wanted to get your wardrobe in order and have a myriad of outfits ready to go for each and every occasion, then now is the time to get started! Shoot me an email, info@styledbysashamaks.com and contact me here, to schedule a complimentary 15 min phone consultation. We can go over your exact needs and all the styling services available. Check out my website and my Yelp reviews. Coat: Burberry, contact Closet 1951, similar here / Shirt: Dolce & Gabbana, contact Closet 1951 / Jeans: vintage Levi’s / Bag: vintage Chanel, contact Closet 1951 / Platform sneakers: Stella McCartney, contact Closet 1951 and here. Earrings: Versace, contact info@sashamaksvintage.com / Kenneth Lane, bracelet, here / rings: personal collection, I’ve linked similar below.